The Ralph Lauren coat boasts a heating system made from electronic-printed conductive inks, pressed in the shape of an American flag with a carbon and silver solution. TODAYOther hot — while not necessarily heated — items included a vintage-inspired wool sweater in red, white and blue color-blocking, fringed suede gloves and, Alexa Knierim’s favorite, the hoodie-footie pajamas . 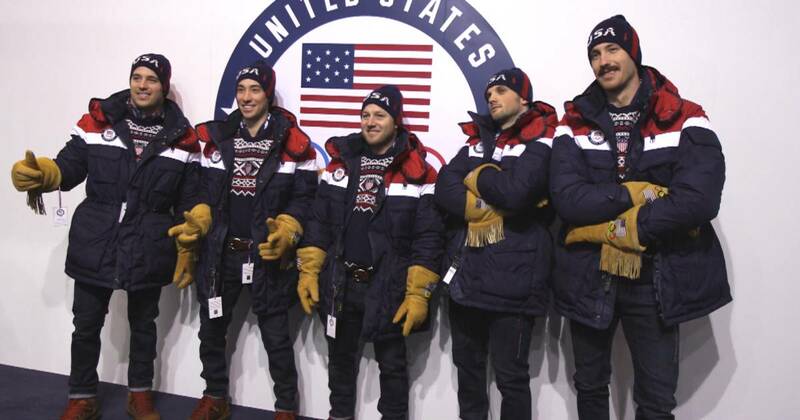 “Okay so this is the hottest thing around right now, it is the team USA onesie,” the figure skater told TODAY while she modeled the adorably cozy gear. "I've never had gloves that would give me bangs," laughed figure skater Adam Rippon of the boldly fringed design. TODAYWhen it came time to shop for less practical items — like diamond-encrusted Olympic rings — teammates Kelly Clark and Maddie Mastro helped each other abandon their buyer’s remorse. TODAYA few hours later, athletes left with two big bags filled with more than 50 pieces of clothing, all "processed" and finally ready for Pyeongchang. Like the wrapping paper on a special gift, the Olympic gear makes the games all the more surreal for its dedicated athletes.